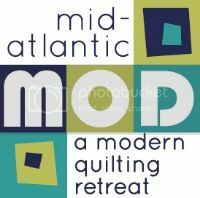 mid-atlantic mod: a modern quilting retreat: Attendee E-Mails - Check your Spam! Attendee E-Mails - Check your Spam! Hi, all - there have been several e-mails that went out recently to MOD 2015 Attendees. Please make sure you have received the latest messages because that is our primary means of communicating with you about the retreat! Workshop supply lists went out via EventBrite (only to people who signed up for workshops) and an e-mail about our fantastic quilt shop sponsors that are offering pre-orders for shipping to the event went out via MailChimp. If you didn't receive these e-mails, make sure to check your spam folder. If you don't think you've received the messages, please get in touch with us via e-mail. More updates will be coming soon. Can you believe the retreat is just over 2 weeks away?